A scruffy lookin’ nerf herder, and a few friends. There’s a new Star Wars movie out this week! The Last Jedi might still feel fresh in your mind, but Solo: A Star Wars Story hits theaters in just two days. Not been following all the news and reveals from the young Han Solo biopic? We’ve compiled all of the officially released info (no spoilers!) so you’re fully prepped to visit the seedier side of a galaxy far, far away this weekend. Han Solo (Alden Ehrenreich)—The man, the myth, the legend, just before he was either the myth or the legend. A young ruffian from the planet Corellia, Han Solo is a wide-eyed adventurer dreaming of getting his big break, and the chance to make a living flying ships any way he can. He finds himself thrust into the life of cons and smugglers after a chance encounter with some smugglers in search of a new crew. Chewbacca (Joonas Suotamo)—Of course, he’s Han’s future co-pilot, but we don’t actually know much about how Han and the young Wookiee meet in Solo (outside of the fact that Han rescued Chewie from slavery at the hands of the Empire), just that he’s along for the ride as Han finds himself pulled into the smuggling life. Qi’ra (Emilia Clarke)—A cryptic woman who grew up with Han on Corellia, Qi’ra is a major player in the galactic underworld by the time she meets Han again during the events of Solo. The trailers have teased her knowing some mysterious secrets about who Han really is, so she’ll likely hold some intriguing leverage over him during the course of the movie. Val, Beckett, and Han on the frozen world of Vandor-1. 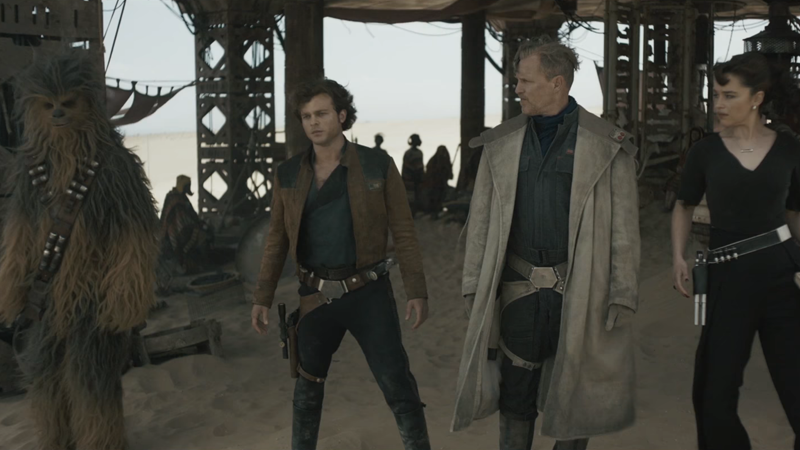 Tobias Beckett (Woody Harrelson)—A die-hard rogue, Beckett recruits Han on the planet Mimban for a series of heists, becoming the young man’s mentor in the ways of the galaxy’s best criminals. Val (Thandie Newton)—A close Beckett associate, she’s one of the most mysterious characters in the film, if only because we’ve barely seen her in any footage released so far. Lando Calrissian (Donald Glover)—Captain of the Millennium Falcon, master Sabacc player, and owner of multiple suave capes, Lando Calrissian is a hotshot smuggler introduced to Han and the crew by Qi’ra as they hunt for a pilot to join their heist. Also, he’s apparently Star Wars’ first officially pansexual character, but whether or not that actually gets acknowledged in the film remains to be seen. L3-37 (Phoebe Waller-Bridge)—Lando’s droid accomplice and the current co-pilot of the Falcon. A quirky, female-pronouned droid with a dry British accent, L3 is a “self-made” droid—literally, as in she built herself out of the random parts of other droids. She’s very excited about beating people up and taking dangerous jobs. Rio Durant (Jon Favreau)—A multiple-armed alien who joins Beckett’s crew for a train heist on the snowy planet Vandor-1. We’ve not seen Rio anywhere beyond this, so maybe something rather unfortunate happens to the poor little guy. Dryden Vos (Paul Bettany)—A sinister gangster once set to be played by Michael K. Williams, Vos is a swanky, face-scarred criminal who is the leader of the Crimson Dawn crime organization. Vos hires Beckett’s crew for a big job, and at some point after she left Han on Corellia, Qi’ra became one of his top lieutenants. Enfys Nest—An alien leader of a swoop bike gang called the Cloud-Riders, who are a deep cut reference to some of the earliest Marvel Star Wars comics. Nest hounds Han and the crew across multiple worlds over the course of the movie. Some muddy, miserable Imperials on the planet Mimban. Solo will take Han and the crew to a whole bunch of worlds never seen on screen. A lot of names are pretty familiar from Star Wars history, though. Corellia—The homeworld of Han (and presumably Qi’ra), Corellia is a major source of ship manufacturing for the Empire during Han’s youth, and the Imperial presence on the world is severe. Mimban—A swamp world that is the site of major conflicts for the Empire and local rebel forces, Mimban is the dreary locale where a young Han Solo serves as an Imperial serviceman. This is not only where he meets Chewbacca, but also Val and Beckett, who give him a chance to escape the monotonous life of a soldier and follow his dreams. Before Solo, Mimban was best known as the planet Luke and Leia visit during the infamous Splinter of the Mind’s Eye, the first ever original Star Wars novel, published in 1978. Vandor-1—A snowy world that’s been a huge part of the trailers as the site of a big heist on an Imperial freight train called the Conveyex, where Beckett plans to test Han’s worthiness to join his crew. Kessel—The infamous home of the mines which hold the illicit, deadly drug Spice, and the slaves used to harvest it. Kessel will be a major location in Solo partially because it gives its name to the legendary Kessel Run, an act of speedy piloting Han will spend the rest of his life claiming he completed in under 12 parsecs. Is this the legendary 12-parsec Kessel Run in action? Han Solo is one of the most iconic Star Wars characters around—and Solo is not the first time his backstory has been delved into in either the old Expanded Universe or Disney’s revamped canon (it will also likely not be the last piece of media to explore his pre-A New Hope days). But the more things have changed since the Expanded Universe came to a close with Disney’s acquisition of Lucasfilm, the more things have stayed the same when it comes to certain aspects of young Han’s life. Here’s just a few of the big details from Han’s formative years in the EU that are going to be making their way into Solo. Han’s going to have some Imperial entanglements. In the old EU, Han escaped a hellish childhood on Corellia and found himself accepted into the Imperial Academy at Carida, graduating as a junior officer (thanks to his success in flight training more than his academic ability). In Solo, he still signs up with the Empire, but gets a much more Han Solo-suitable position: a lowly grunt serving on a hellhole backwater world. Just like in the EU, though, it’s his Imperial service that sees Han’s path cross with the enslaved Chewbacca. We get to see Han win the Millennium Falcon. Lando notes in Empire Strikes Back that he lost his beloved freighter to Han in a game of cards, and while the EU had its own versions of the tale, Solo will give us the “official” version of that moment, during what appears to be during the first encounter between Han and Lando. Bold play, Mr. Solo, but apparently it works out? The infamous Kessel Run will finally be shown. Despite Han’s boisterous claims to Luke and Obi-Wan about the speed—well, a parsec is a measure of distance, but let’s not go into that—with which he completed the legendary run, we’ve never actually seen or learned just what the Kessel run actually was, or even if Han really completed it. In the EU, the run was a well-known smuggler route from the spice world to the planet Formos, but if the trailers are anything to go by, in Solo it looks to be a major chase sequence as the Falcon escapes Imperial forces. Happier times for Phil Lord and Chris Miller on the Millennium Falcon set built for Solo. Beyond the fictional world of Solo, some of the biggest news stories that have surrounded the movie are about what happened on the other side of the camera. Solo was originally to be directed by Phil Lord and Chris Miller, the duo behind The Lego Movie and 21 Jump Street. Months into production, it was abruptly announced that the pair had been let go from the film, and Ron Howard came aboard. Rumors about just why the duo had left the film flared up almost as quickly as Lord and Miller were replaced, alleging disagreements in style and production speed between the directors and Lucasfilm president Kathleen Kennedy, which became so severe that she made the unorthodox decision to fire the directors mid-production. While the details will likely never be truly known, it’s a story that’s hung over Solo for almost a year now—leading to a lot of concern from fans about how the film would turn out, given that the previous Star Wars Story film, Rogue One, also went through some behind-the-scenes issues. Despite the focus on the drama, it doesn’t appear to have particularly damaged the final product, if early reviews of the film are anything to go by. Unlike Rogue One, which had a bunch of reshoots, it seems like the differences in what was left of Lord and Miller’s movie in the final cut and what was reshot by Howard will be less noticeable. This is perhaps because, despite scriptwriters Jon and Lawrence Kasdan insisting the DNA of Lord and Miller’s vision is still a major part of the film, Howard allegedly shot around 70 percent of the final film.